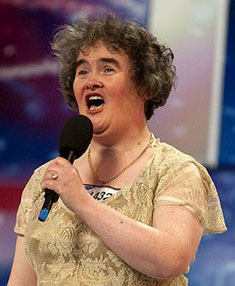 Scottish spinster Susan Boyle drew laughter on Britain's Got Talent when she said she wanted to sing like Elaine Paige, but she stunned both audience and judges when she belted out the first notes to "I Dreamed a Dream" from Les Misérables. Such a beautiful sound erupting from someone so homely grabs the heart of anyone who watches it for the first time. Aggregated, the videos of her performance on YouTube have received over 100 million views. Little imagination went into the performance: details follow carefully those recorded by Paige, so much so that it is clear she studied from Paige's recording. Boyle received two years of voice training from Fred O'Neil and had never sung professionally, though she recorded a single track on a 1999 charity CD, and that same year produced a demo tape. After a second performance, "Memory" from Cats, Boyle unexpectedly placed second overall in the talent competition, losing to a dance troupe, Diversity. Our Lady of Lourdes Church, Blackburn, Scotland.